Summer is coming. And with summer, comes the heat. And with the heat comes the desire to beat the heat with water. Swimming pools, cold showers, splash parks, and waterparks help us to cool down on a hot summer day. But what does all that water do to our skin for so long? MDPen, a producer of the best micro needling pens, will explore what the water and chlorine does to your skin in this blog post. Contact us today! Chlorine is a toxic gas at room temperature. Because chlorine is toxic, it has made our drinking water and swimming pools safe as it kills harmful bacteria. Chlorine is the basis of sodium chloride, the chemical name for common table salt. It’s an essential nutrient found in the earth that all living organisms need to survive (it’s why salt licks are popular with animals). Chlorine is also used to make many products, including computers, cell phones, and some medicines. Chlorine bleach is used in household cleaners to disinfect surfaces. Chlorine has made human’s progression in the world possible and can be argued as one of the most impacting discoveries in the nineteenth century. Before the discovery and use of chlorine in drinking water, thousands of people died every year from waterborne diseases such as cholera, typhoid fever, dysentery and hepatitis A. It was used to chlorinate drinking water beginning in Jersey City, New Jersey, in 1908. In 1918, the federal government mandated all drinking water be disinfected with chlorine. It is used in water treatment plants as well. Chlorine, however, evaporates; thus, it must be added continuously to our water sources to maintain safety. Chlorine is used in the form of hypochlorous acid because it kills bacteria and other microbes in drinking water and public swimming pools. These waterborne pathogens are nasty critters that can cause many different types of illnesses, such as diarrhea, swimmer’s ear or skin rashes, including athlete’s foot, if it weren’t added to swimming pools. Because chlorine is a chemical with toxic properties that kill bad bacteria and viruses, it also can cause irritation to our skin and hair, red or sore eyes, and/or a stuffy nose because the chlorine reacts with the proteins in our skin. The distinctive ‘chlorine aroma’ associated with swimming pools is not the result of chlorine itself, but of chloramine, a chemical compound produced by the reaction of free dissolved chlorine with amines in organic substances. Condition your hair. Chlorine clings to hair like a baby koala does its mother. The hair shafts absorb chlorine, removing your hair’s natural lubricant, which results in split ends and broken hairs. Use conditioner under your swim cap when you swim. Wet your hair beforehand, so your hair will absorb water instead of chlorine, and wash your hair immediately afterwards. Wearing a swim cap will also help keep the chlorine off your hair. Condition your skin. Chlorine has the same effect on your skin as it does your hair. Chlorine strips your hair of its natural oils, leaving your skin tight and itchy. Swimming can exacerbate existing skin problems, such as those with sensitive skin or skin conditions such as eczema. Put lotion on before you go swimming so your skin will absorb the lotion instead of the chlorine. If you’re swimming outdoors, make sure your lotion contains UV protection as well. Just like with your hair, rinse the chlorine off your skin as soon as possible after you are finished swimming and apply a high-quality moisturizer or oil. Green hair. This is not as common as it once was because contrary to what most people think, green hair is not caused by chlorine in the pool. It’s caused by chlorine’s interaction with copper pipes and other metals that older pools used. Now, most newer pools use a composite plastic material, eliminating this phenomenon. However, if you notice your hair has turned green from this chemical reaction, a shampoo designed to remove color can help. Protect your hair with the tips above to help prevent green hair from occurring again. Routine skin care. Routine skin care will help mitigate the damage the pool does to your skin by protecting, cleansing, and moisturizing your skin. By having the healthiest hair and skin possible, you’ll be in a great place to minimize damage not only for the pool but anywhere you go. Drink water. Drinking water is so simple, but so hard for many of us to execute. Our body needs water to effectively exist. Your skin cells, having so many jobs from protecting our body from bacteria and helping us to cool off, need water consistently. When we’re well hydrated, we not only are healthier and function better, but our skin is healthier and happier as well. We’ve all been in pools and baths and emerged with wrinkled skin. But does that harm our skin? Wrinkled skin is not a sign of skin damage. Serum, the oil on the surface of the skin that keeps the bad guys out, helps to keep moisture in your skin’s cells, and also can cause acne when too much is produced and dirt and grime get stuck in pores, covers a layer of skin cells, which is what exfoliating your skin does — gets rid of this layer. This dead skin cell layer holds water when exposed for a certain period of time, especially the hands and feet that have proportionately more dead skin cells than other areas of the body. Once the serum gets eroded from the water, there’s nothing holding this layer of dead skin cells in, so they expand, creating wrinkles. Swimming in the ocean where the water is salt water (or a salt water pool) actually is good for you. Salt is a cleanser, much like an exfoliate. Swimming in salt water promotes circulation. Swimming in salt water boosts your immune system. Swimming in salt water hydrates your skin. Swimming in salt water can also help relieve eczema and skin itchiness. Salt water contains many natural substances, which your skin absorbs and needs. These include vitamins, mineral salts, amino acids, and trace elements. Salt water helps your skin expel toxins. 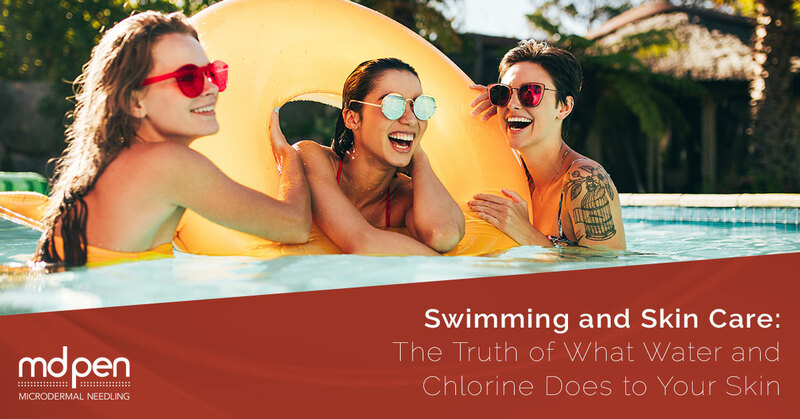 When you partake in a leisurely swim with your friends on a hot, summer afternoon, you’ll be exposed to chlorine, which is much better than what you’d be exposed to without chlorine. Unless you swear off swimming pools, this is a part of swimming. There are things you can do, however, to limit the impact of chlorine on your skin. And if you’re swimming in an ocean, you’ll experience added benefits as well. MDPen is a leader in microneedling pens. Like water content in your skin cells, our aim is to improve your skin through microneedling. What is microneedling? Microneedling uses tiny needles to create micro injuries to the skin, which then heal by creating a new, healthier layer of skin. Your dull, dead skin layer will fall off, revealing a new, youthful layer that has repaired itself and strengthened itself, including any injuries you might have sustained to the skin, such as acne scarring or stretch marks. MDPen helps practitioners offering microneedling in their day spas, clinics, or medical practices by offering microneedling supplies, proprietary skin creams designed to deliver powerful ingredients to your skin both before and after microneedling, and by offering a practitioner portal, where additional instructional materials such as videos can be found. Our Facebook page is also a wealth of information along with our News page, so you can learn all about microneedling and microneedling benefits. MDPen is passionate about sharing the technology of microneedling. We do this through offering microneedling training courses across the country, so more practitioners can offer microneedling. We offer financing for those who qualify, which allows you to pay for the microneedle through microneedling services. To stay up to date on all that is happening in the microneedling community, we offer on-going training opportunities through our weekend workshops specifically designed for experienced microneedling practitioners. Not only do you gain hands-on practice to microneedling, but you’ll learn about the latest in microneedling, such as Vampire Facials and RF microneedling. Our mission is to make people feel better about themselves through microneedling. Join with MDPen today as we continue to offer the best support to practitioners, the best training opportunities, and the best microneedling equipment!